This ‘trick’ is a ‘handy’ way to estimate how much time until sunset. From a preparedness point of view, it could help during any number of situations. Such as estimating enough time to find (or make) shelter during an outdoor excursion. Or the time remaining to travel without the aid of flashlights or headlamps. Estimating the remaining time to accomplish the tasks you need to before the sun sets (collecting firewood, starting a fire, making dinner, etc.). For the geographical latitudes within the ‘lower 48’ of the United States, the following method can be used to approximate the time remaining until sunset. This method works for an average adult with an outstretched hand. Each finger will equal approximately fifteen minutes of daylight left. So four fingers will equal about one hour. Size of one’s hands makes a difference. Adjust for your own as described below. 1. Stretch your arm out in front of you toward the sun. Bend your wrist so that your palm is facing you and your hand is horizontal with your thumb on top. The bottom of the sun should rest on the top of your index (pointer) finger. 2. Put your other outstretched hand below the first. 3. Now move your upper hand under the second and continue “walking” your hands down toward the horizon, counting the hands as your go. 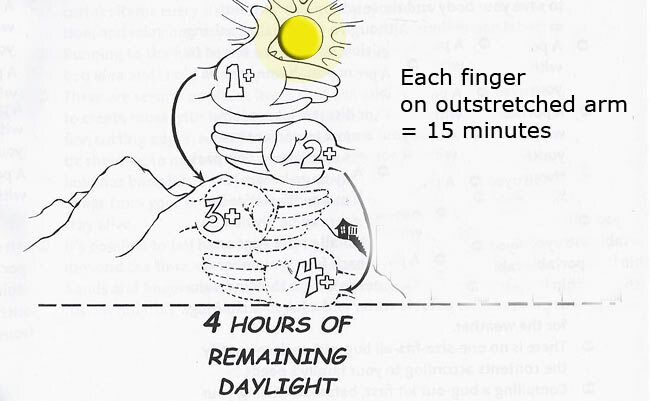 The accompanying illustration shows four hours (sixteen fingers) of daylight left. Keep your arms straight as you slowly walk both hands down toward the horizon. Don’t get sloppy with this method by using only one hand or by putting your hand too close to your face because your elbows are bent. Arms straight. Just saying. The angular speed that the earth travels is the same for all of us: 360 degrees in 24 hours = 15 degrees per hour. But that speed appears differently along different paths depending on your geographical location. In the tropics the sun sets almost straight down into the horizon, at a right angle. In the far northern latitudes the sun approaches the horizon at a more shallow angle. This technique works best at mid-latitudes, (e.g. most of the USA). But it is latitude dependent. The further north, the sun will set a bit later than this method suggests (more daylight). Measure the number of (your) finger widths between the sun and the horizon and note the time. Then, either look up the sunset time for your area (internet search) or note the time at sunset. 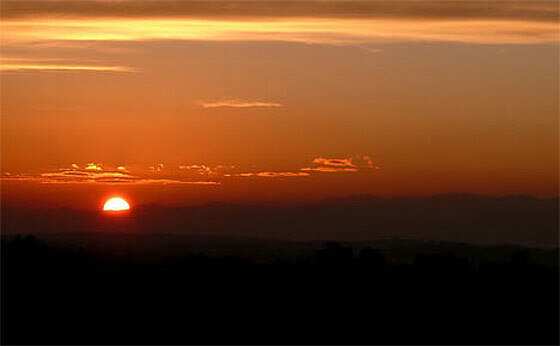 Tip: Keep in mind situational awareness when hiking in the woods and estimating the time of sunset. The canopy of trees will hide alot of sunlight and it will get dark sooner than ‘sunset’. Especially if mountainous. Generally speaking, as you become more experienced in the outdoors, it becomes fairly easy to tell how long until sunset, just by observing the sun’s position at any time. That said, hopefully this tip helps. Good article Ken. Many of us “older” readers have become fairly capable at reading our sunlight hours…..but those NOT so familiar with the sun and/or outdoors will value this discussion greatly! I teach this every deer season to those who aren’t out n about much. – The first time I ever saw this technique was in the early 60’s in the old Mark Trail comic strip (showing my age, ). I was taught the same technique at age 11 as a Boy Scout and have used it all over the world. It’s pretty accurate for me, and most people will discover that their hand size and arm length pretty much adjust to fit. Agreed, learned in the Scouts. learned a LOT in the Scouts come to think on it. A good reminder Ken, and a good tool to learn for those that did not know, and are just starting the Survival stuff. BTW, you really want to learn, talk to those “old fools” out there, you may find they are not so foolish as some think. – Read somewhere that when the Astronauts were doing their survival training, they found the old 60’s editions of the Boy Scout Handbook and the Boy Scout Fieldbook were better than the military survival manuals they were issued. Might be worth looking for. Yes, I was one merit badge short of my Eagle. Got hung up on Lifesaving, and discovered girls about the same time. Source of great disgust to my parents and Scoutmasters. Also upset them when I turned down an appointment to West Point about the same time. Don’t forget. When putting your left hand up, don’t look directly at the sun, look at your hand. You will sort of automatically line up with the sun. NEVER look directly at the sun to line up. A quick glance might be o.k. , but only a quickie. Correct me if I’m wrong. Looks like a lot of us older guys were in scouts. Learned a lot of stuff there. Yup, I’m an Eagle scout. Best time in my life was hiking through the Bob Marshal, Selway wilderness and floating the Missouri river from Fort Benton and winter camping back in the late 60’s and early 70’s. The woods was my play ground as a boy, I was very lucky to grow up when I did. Yup, me too. The troop I was in was more focused on learning things then just getting badges. We would go to a Jamboree and see some people that had badges galore. Then when it came down to activities, many of those badges galore were lacking in many things that were just beyond the requirements needed to qualify for particular badges. We would go out camping for a weekend or so and do all kinds of things without the recognition of accomplishment. That was fine with me. I enjoyed going out having fun and leaning new stuff. Getting a badge or badges for doing those things was a far second. Actually we really didn’t even think about getting specific badges for those things. That is not to take away from those that had a lot of badges. I knew some that had badges galore and earned every single one. Heck, some of them you could drop off in the middle of nowhere and they would probably have no problem surviving. Then, I left that troop and went to one that was much closer to home. They were mostly focused on getting badges doing stuff while indoors. After a few months, I had enough of that. Didn’t go back to the first troop as it was just too far away from home. Cool – I was in scouts back in the sixties as well, but never learned this one. I guess you can teach an old dog new tricks.